Nature, of course, called me out of my tent at 4:27 this morning. In the darkness of that predawn, I was mesmerized by the sight of fireflies still sparkling against the velvety blackness of the forest. A solitary bird sounded from high up in one of the trees. Returning to my tent, I knew sleep would not revisit me, but I chose repose indoors rather than sit with mosquitoes outdoors. But the solo bird, by 5:00, was joined by a chorus, mostly of cardinals. 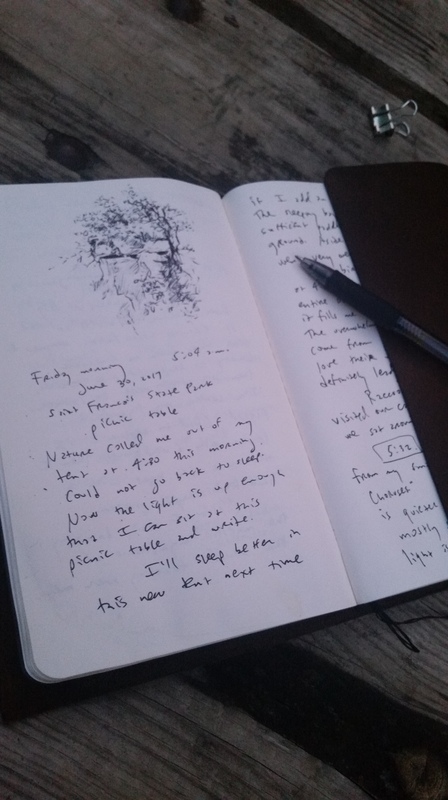 Light was breaking, so I chose this picnic table and resumed my summer journal. The morning is filled with sounds, the raccoons have withdrawn to the woods, and my spirits are soaring with this “pulse of the morning” (I miss you, Maya Angelou). 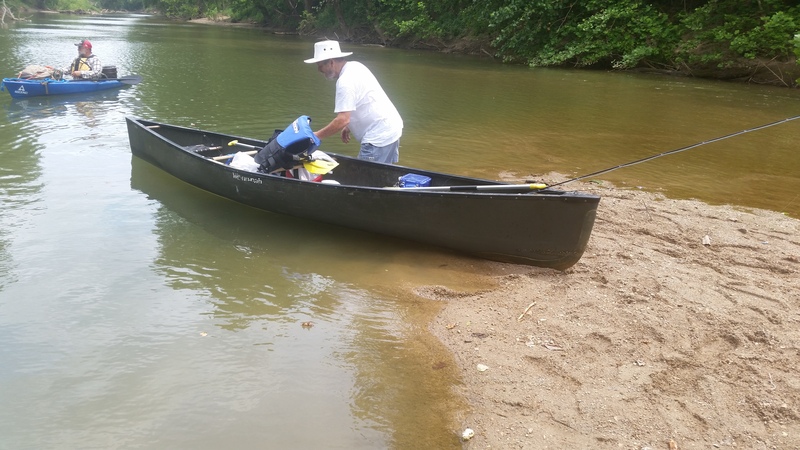 At 9:55 tonight I’ve just finished a campsite dinner with Wayne White and Mark Nelson, having completed a six-mile canoe and kayak fishing trip down Big River. 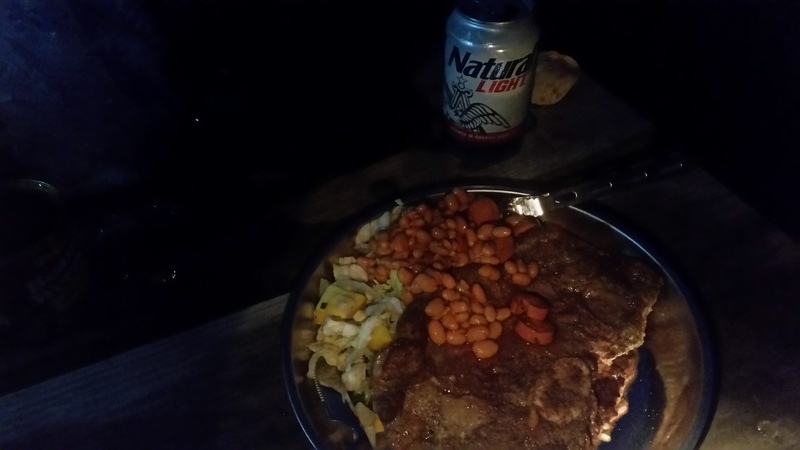 Wayne is the quintessential campfire cook, stuffing us tonight with steak, roasted veggies from his garden, and beans. Now we’re just staring silently into the fire, listening to the night sounds and rhapsodizing at the sight of hundreds of fireflies in the forest at Saint François State Park. The fishing was delightful, and the clear water gliding over the copper-colored rocks was beautiful beyond description. For years, I’ve known the sensual delight of wading trout streams in Colorado, but today was my first experience gliding in a canoe over beautiful waters, buoyed by the swift current. We’ll retire to our tents soon as the weariness sets in from the excitement of the day. Thanks for reading. We feel blessed tonight. Taine has the admirable ability to teach others today what he did not know himself yesterday. I posted above what I just read from Cézanne: A Life, by Alex Danchev, because it reminded me of what I’ve known throughout twenty-eight years standing in classrooms–that I frequently shared information just gleaned from my own studies. As a teacher, I always had homework. Today I still shake my head in wonder that I managed to survive, and at the same time recall with gladness that “the truly educated never graduate”–I am a student for life. Hence, while on vacation, my reading of this engaging Cézanne biography. I am overflowing with profound gratitude that I have finally retired; I will not return to my high school classroom of twenty-eight years when the fall arrives. Visiting my parents and siblings in the St. Louis area has brought a delicious sense of leisure. How satisfying it is to do as I choose now, with no scheduled appointments or apologies. 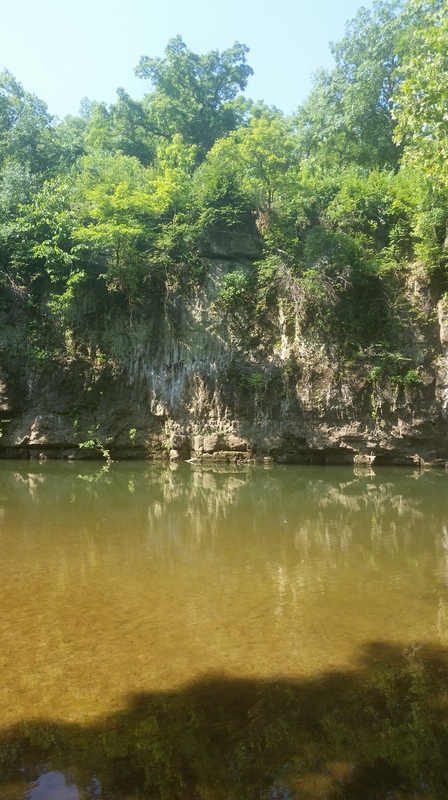 As posted in the last blog, our recent river trip was fraught with difficulties and comedy, and we had to abort two days ago. Yesterday we made up for it by fishing a public lake in Bonne Terre, Missouri on a seventy-degree day. I posted above the picture of my high school buddy Wayne preparing to launch with his grandson. I chose this time to stay on the shore and keep dry. 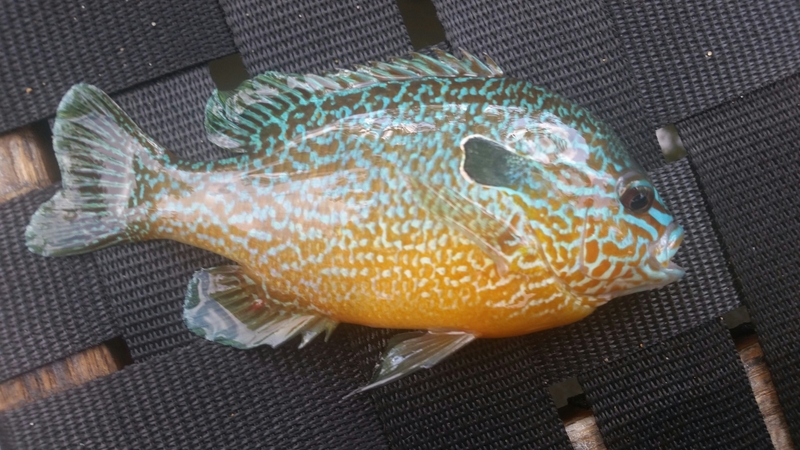 Fly fishing produced a few of these . . .
. . . and bait fishing later produced one of these. The day blossomed into a beautiful one, with long hours stretched out on the grass under the shade of large trees at lakeside, and frequent laughter as we shared reminiscences of high school foibles. Soon, I will reunite with Wayne and Mark for another river adventure, hoping to post more success on that one than the trip we just attempted. I didn’t rush this 8 x 10″ watercolor of one of the Palestine, Texas locomotives I photographed during a recent visit. 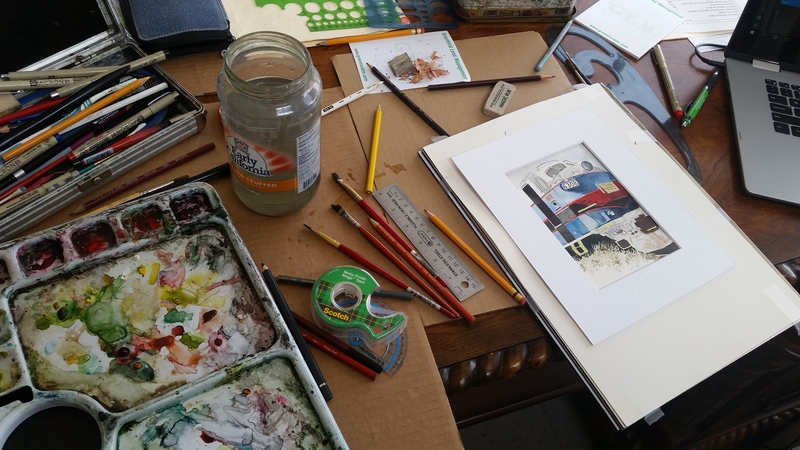 I have embarked on a large-scale Christmas holiday project involving watercolors of train subjects and have been gathering material for this over the past several months. Now that I have officially retired from my full time job, I anticipate more focused work on this project. I started this watercolor a few days ago, and have chipped away at it in a leisurely fashion. Though it is now signed, I am looking at it and feeling it needs some more fine tuning. I seem to have trouble letting a watercolor go. The most challenging part of this composition was the shadow side of the locomotive. I would normally just cover it in dark washes, but as I studied the photograph I took, I was intrigued with all the reflected light on the metal surface, and wanted to capture those geometric shapes of subtle colors as best as I could. I’m not sure if I’ve been successful on this venture, but I’m convinced that I’ll take shadows more seriously in future watercolor attempts. I think I’ve found new territory in this regard. The world’s spiritual geniuses seem to discover universally that the mind’s muddy river, this ceaseless flow of trivia and trash, cannot be dammed, and that trying to dam it is a waste of effort that might lead to madness. Instead you must allow the muddy river to flow unheeded in the dim channels of consciousness; you raise your sights; you look along it mildly, acknowledging its presence without interest and gazing beyond it into the realm of the real where subjects and objects act and rest purely, without utterance. The best part about working all day in a gallery without television or radio is not hearing news chatter or small talk. All I did throughout the day was paint, and my mind drifted freely down a myriad of tracks. 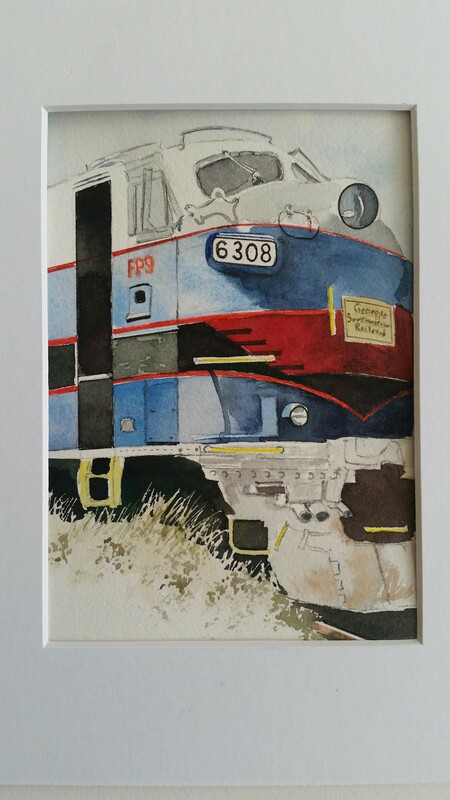 I started and finished a 5 x 7″ watercolor of an F-series diesel, thus rounding out a trio of train compositions during my four-day stay here. But if I can bear the nights, the days are a pleasure. I walk out; I see something, some event I’d otherwise have utterly missed and lost; or something sees me, some enormous power brushes me with its clean wing, and I resound like a beaten bell. This is the first time I’ve been able to lodge at my favorite place, “The Store”, for more than a weekend. Waking at 6:11 on my fourth and final morning, I took the leisure to enjoy a cup of coffee and read Annie Dillard as the sun pinked the eastern skies over rural Texas. During the past two morning watches, I certainly felt some sort of affirming power brushing me “with its clean wing,” and I went to work in the gallery with a renewed sense of purpose. We don’t know what’s going on here. If these tremendous events are random combinations of matter run amok, the yield of millions of monkeys at millions of typewriters, then what is it in us, hammered out of those same typewriters, that they ignite? We don’t know. Our life is a faint tracing on the surface of mystery, like the idle, curved tunnels of leaf miners on the face of a leaf. Reading Annie was a soul-stirring event again this morning. I drove the fifty minutes to the gallery, and by the time I arrived, I knew that I wanted to begin a fourth watercolor on this fourth day. Something inside drives me to create, to express, and now that I am retired from a full-time job, I am enthused about responding to this compulsion. I make art because it’s in me. I am proud of how this locomotive is progressing and wanted to post it tonight before shutting down. I have already signed it, but have little doubt that I’ll find several things tomorrow that I want to do with it. I’ll be working in The Gallery at Redlands until about 9:00 tonight, so I still have nearly three hours to do whatever I feel like doing, probably resuming work on the abandoned mailbox I started this morning. Tomorrow, with fresh eyes, I’ll look at the locomotive again and perhaps do some final tweaking on it. This morning’s introduction to the New Day lies far beyond adequate description, but I shall try, nevertheless. Waking around 6:30 without an alarm (thanks to retiring to bed much earlier than my custom), I rose to a beautiful eastern sun, and after making coffee, settled onto the porch of this old store where I reside while in the country. still like a star in the world’s sky. When I lingered on those final lines, holding my thought to one steady idea, the large tree in front of me suddenly stirred with life as the morning breezes whispered through the leaves, and I felt my face caressed by gentle winds. My thoughts immediately recalled Emerson’s lines from Nature that open today’s blog, and I felt a rush of eudaimonia, embraced by a beautiful morning. All thoughts of driving to the city evaporated, and I sat in that rocker for I don’t know how long, savoring the gift of that sublime moment too deep for words. From my early years of studying the Greek New Testament, I have always been fascinated with the idea of logos, and have enjoyed reading Heidegger’s rendering of that word as “gathering together” or “gathering process.” Recently I have pondered my endeavors in making art as attempts to bring together all that I have encountered in my life’s experience and express it in watercolor compositions that have something meaningful to say. My attempts at making art have been an engagement with the logos, an encounter that involves assembling my key ideas into some kind of creative expression. This morning was timely for me, as I knew I had a significant opportunity before me in the gallery to make art that matters to me. As I drove through the country, I suddenly stopped, turned my Jeep around, and returned to an abandoned open mailbox shaded in the trees and engulfed in flowers. I took several photos, including the one posted above, and have plans to work on this composition as well. Once at the gallery, I resumed work on the old Texas and Pacific #610 that remains here in Palestine. This locomotive was built in 1927 by Lima Locomotive Works, and only seventy of this model were made. This is the only known one still to exist today, and in 1977 it was added to the National Registry of Historic Places. If my strength holds up, I’ll continue working in The Gallery at Redlands till 9 p.m. The Red Fire Grille across the lobby brings in a sizeable dinner crowd on Friday nights, and I wouldn’t mind patrons drifting into the gallery as I paint. Rising early this morning, I chose to pause with coffee and a good book on the porch of this old store. Reading the section from Heidegger that I just posted above moved me profoundly. I will have more to write on this subject later today, but now I need to begin my 50-minute drive into town to open the gallery, and resume work on some watercolors that are driving my imagination. More later, I promise. Thanks always for reading. Sitting in this dark country kitchen tonight, I feel that I am drifting in the current of a moonless midnight river without oars, and without compass. With the banks on both sides concealed in the night gloom, and unable to discern what lies immediately before me, I find retirement very scintillating and intriguing. The senses feel sharp, and the anticipation positive. In midweek, I decided to make the two-and-a-half-hour road trip to Palestine, Texas, and resettle The Gallery at Redlands for a few days. This new gallery opened in March with my one-man-show, and the relationship I have enjoyed with the proprietors since that day has been deeply satisfying to my soul. When I retired last week from twenty-eight years of teaching school, I was happy to know that a new chapter was waiting to be written. After yesterday’s road trip following a mostly sleepless night, I found myself extremely exhausted by five in the afternoon. I had already put in six hours at the gallery and another hour at a Rotary Club meeting where I made a number of new acquaintances. I managed to frame a couple of my recent watercolors, began work on a new painting and resumed work on a painting abandoned last year. Ten more works were added to the display I already had in place, and the interior of the gallery felt like home once again to me. I could feel myself smiling internally. After closing shop, I made the fifty-minute drive out into the country to tuck myself in to my favorite hideaway—an old store that friends allow me to make my home-away-from home, off the grid beside a gravel road. 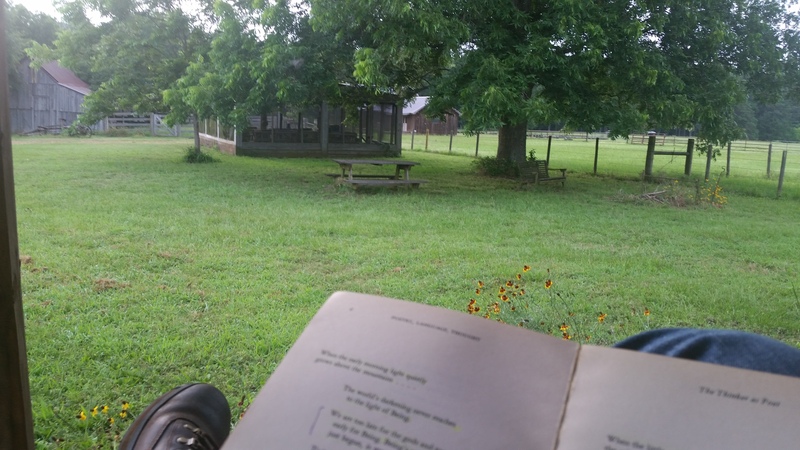 Settling on the porch with a fresh cup of coffee, the cool winds concealed the reality of a 95-degree late Texas afternoon, and I gazed across acres of sun-washed pastureland, letting my thoughts drift. Finally at 7:30, I could no longer keep my eyes open, so I retired to bed, knowing that was probably a mistake. Sure enough, at 11:50 I awakened, and have been unable to sleep since. My mind is too awake, too interested, too consumed with possibilities of the new Thursday that has yet to dawn. I sit now at the large kitchen table of this old store, composing this “blind blog” (no Wi-Fi in this remote location), waiting for drowsiness to lead me back to bed. Palestine is a city of trains, and the Texas Railroad Authority has granted me access to some of their historic locomotives, including old #610. This behemoth pulled the Texas Freedom Train all over the state during our nation’s bicentennial in 1976. Following that year, the locomotive served time in Atlanta, Georgia until it completely tired out, and was returned to Texas. For nearly three months, I have waited for the opportunity to paint this enormous machine, poring over a number of photos taken from a recent visit to the shed where it’s been parked. I have a number of experimental ideas in mind as I try for the first time to render this loco’s portrait in watercolor and pencil. While I’m working in the gallery over the next few days, I also hope to complete a larger watercolor of a passenger rail car I found in Eureka Springs, Arkansas during a visit last year. I’ve always been dissatisfied with the muted colors on the side of the car, and think I can try a few tricks to enrich them. The foliage also needs more work. (Next day) After falling asleep around 2:30 this morning and sleeping till nearly 7:00, I rose to a more promising dawn, and the moonless night river yielded to a sunny morning drive, my Jeep cutting across the countryside, and my heart filled with a renewed sense of adventure. 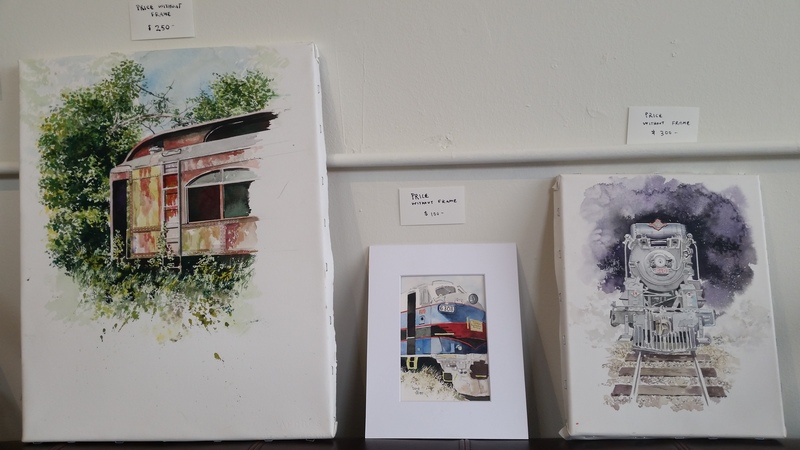 By mid-afternoon things were hopping in The Gallery at Redlands in Palestine, as I met several new friends, and managed to frame two more watercolors, finish my Eureka Springs passenger rail car, and break ground on the old #610. This is a retired Texas and Pacific 2-10-4 steam locomotive, the largest I’ve seen in over ten years. Seventy of these 600-series locomotives were manufactured, and this is the only one that still exists. Right now, I’m waiting for the background of the painting to dry so I can begin work on the actual locomotive. The draftsman must aggress; only by persistent assault will the live image capitulate and give up its secret to an unrelenting line. I anticipate a struggle and plenty to learn as I attempt to render the details on this complex locomotive. This subject was taken from the store where I gladly live when I retreat to the Texas wilderness. Before retiring to bed last night, I walked into the store room and looked at this section of shelving behind the cash register, grateful for the memories of painting it last year. I worked on this piece last winter while visiting with my parents in St. Louis, and finally got around to framing it. I painted this scene from the Gallery window during my one-man-show last March, and finally got it framed and presented in the Gallery. I plan to spend the next three days and evenings in The Gallery at Redlands, making as many watercolors as I can during this period, and continuing to make friends in the city of Palestine. So far, the experience has been fulfilling.